Speaking at today’s Inform Media Summit in Sydney, Goodwin suggested too many in the industry still don’t understand fundamentally how ingrained in our culture digital is. “We still have heads of digital, digital strategies, digital departments – we bolt on the digital stuff in addition to the rest of what our industry does. That’s not how the modern world works. If you use Tinder, you’re not doing online dating, you’re just doing dating,” he told attendees. Yet Goodwin agreed it’s a complex time for digital, and described the current climate as the “mid-digital age”. New digital technology is causing a period of chaos and everyone is trying to rapidly make sense of things, he said. It’s also a time where many companies make mistakes. “We’re in that mid-stage, where generally things will probably get more complex before they get more simple… We have to live with the complexity right now,” Goodwin said. “When you’re watching TV, you probably have to think about which remote control you use before you think about the show you want to watch. This mid-digital age also sees the world dissected into new and old media, and has triggered a “cultural battle between madmen of the past versus the madmen of the future”, Goodwin said. This is largely because we’re not changing things significantly enough to build on the “power of the new”. So what led us here? Goodwin noted most of the ads people remember are TV commercials over digital creative. “We just sort of dabbled into digital and dealt with it in the quickest way we could,” he said. “And it’s led to this vicious circle… online media was cheap so it wasn’t worth out time, production costs were lower, and it’s no surprise then these ads didn’t perform that well. So no one wanted to pay much for them. And in order to cope, digital media players created more inventory, which led to further deflationary pressure. What this is done is led to “horrible dilemma” in digital media where the value of advertising has plummeted, data is dominating over creativity and short-terminism is rife, Goodwin said. Another assumption Godwin hit out against was assuming that unless it’s targeted, we shouldn’t do it. And as time exponentially increases online, every brand has pushed to be online or felt they were missing a trick. “All of these strange assumptions have created a horrible marketplace where no one really gets benefits from it – as a customer, consumer or human being, we do not enjoy the browsing experience. And as a brand we can’t control what we need, and as a media owner, the CPMs are certainly not great,” he said. What’s also clear is there are some wonderful things you can do that you can’t measure, Goodwin said. 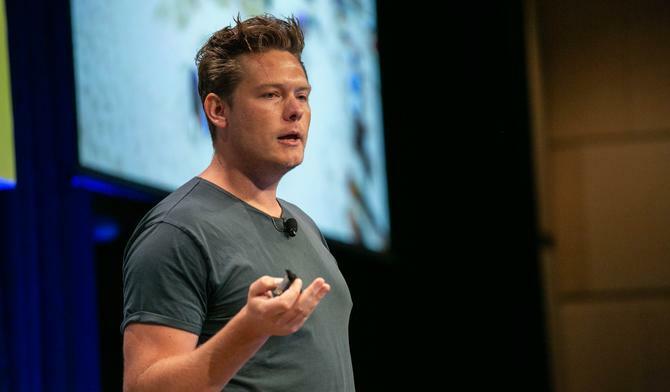 This relentless race to optimisation and “relentless” race towards efficiency is not necessary leading marketers to better results, either, and he said the industry has to be careful to not promote short-terminism over all else. For Goodwin, too many brands are moving money to the point of purchase because it’s the place they can prove something via figures, but it’s a flawed and worrying attribution trend. Yet creative tactics and techniques of the traditional media days are still every bit as relevant today. Goodwin suggested brands matter even more as navigation tools in an age where consumers “never get bored” and are constantly being overloaded with content. “Great brand power and ideals will always work,” he said, pointing to Nike’s controversial latest ad featuring Mike Kapernick as a good example the power of such techniques.